Campari is collecting money for a good cause with its charity project called “Negroni Week”. In the scope of the event week that is staged annually, participating bars place the focus on the classic aperitif that dates back to 1920 and donate one Euro per drink to a charity scheme of their own choice. To advertise the campaign, Campari Germany requested POS materials that correspondingly made the campaign clearly visible in the participating bars, clubs and restaurants, explained how the campaign worked as well as the vintage/art deco style of the classic beverage. Not an easy task, however one that Kandinsky mastered with flying colours. The high-quality collection produced by the Düsseldorf-based agency hit the aim and visual appearance of the campaign on the head and significantly contributed towards the success of the campaign. 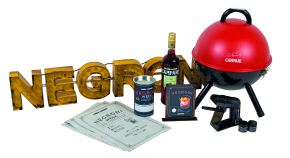 For example, among others the luminous sign that emanated 1920 retro charm ensured a positive brand visibility and the spectacular preparation and aromatisation of the aperitif with wood smoked scents using a smoking gun in the “Smoked Negroni BBQ Grill” enhanced the campaign with additional emotional and earned the brand a prominent place on the bar tops. Handmade branded table displays and donation boxes with a copper finish designed in the vintage optics of the campaign were also integrated into the marketing; displays in front of the bars and clubs attracted further attention to the drink and the campaign. Over 500 bars and restaurants took part in the campaign across Germany this year, worldwide donations to the value of 400,000 US dollars (approx. 385,000 Euros) were collected. The campaign also paid off for Kandinsky: It picked up a Promotional Gift Award 2017 in the category Best Practice.